With all this talk of "identity" going on i wanted to share that I used to be afraid of getting amnesia when i was a child. Every time i hit my head, which was a lot for some reason, i would repeat my name, my address, and what my house looked like to prove that i didn't get amnesia. God asked a question to Adam "Who told you...?" I realize that as a small child with only 2 TV stations in my area (abc and nbc) that i watched a program where someone forgot who they were. This impacted me and caused fear to rise up within me. 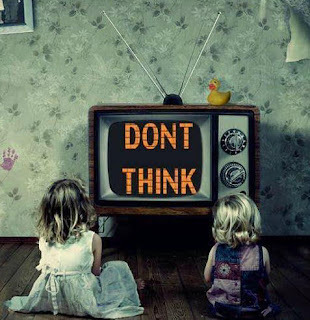 TV not only affected my thoughts but manipulated my behavior as well. In the 90's, because i knew more commercial jingles and TV show theme songs than bible verses i decided to stop watching TV. I wanted to stop being molded by something other than God. When i examine my beliefs i examine where they come from. Who told me what i believe? Is it God or something else? I challenge you to examine your beliefs when they arise. Who told you? God? or someone else?